Currently the catchment area for St Columba’s Primary School includes the town and one neighbouring village, Dunbeg. This means that Catholic children who live as little as four miles from the school are not entitled to free transport. Now Argyll and Bute Council has decided to launch a consultation to extend the catchment to cover the same mainland area as Oban High School, taking in the town’s many outlying villages. The move comes after a formal request from St Columba’s Parent Council. 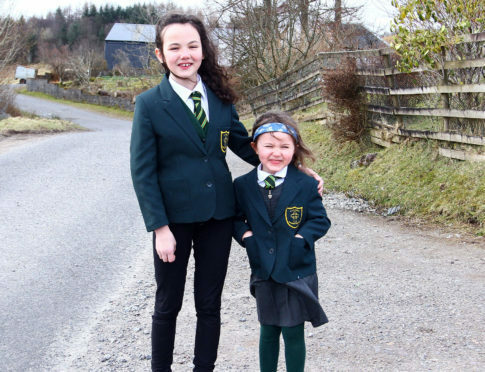 Lucy MacGregor, aged six, lives at Ardconnel Farm, four miles from the school. Currently she is entitled to a “privileged” seat on the school bus. If the catchment area is widened, she will be “entitled” to a seat. At present there is a space for her on the morning bus, however on the way home she has to pay for her seat on a bus which takes her some of the way home, where she is collected by mum Julie or dad Duncan. Mrs MacGregor was “delighted” at yesterday’s decision by the council’s community services committee. The school is based at the Oban Primary Campus, where Rockfield Primary School, with its Gaelic Medium provision, is also based. St Columba’s parents have previously pointed out that if their children attended the Gaelic unit, they would be entitled to free school transport. Helen McGuigan, chairwoman of St Columba’s Primary School Parent Council, said: “The parent council has been pushing for this for 10 years. The council’s Policy Lead for Education, Councillor Yvonne McNeilly, said: “This is an opportunity for stakeholders to have their say on whether the current catchment area should be expanded.